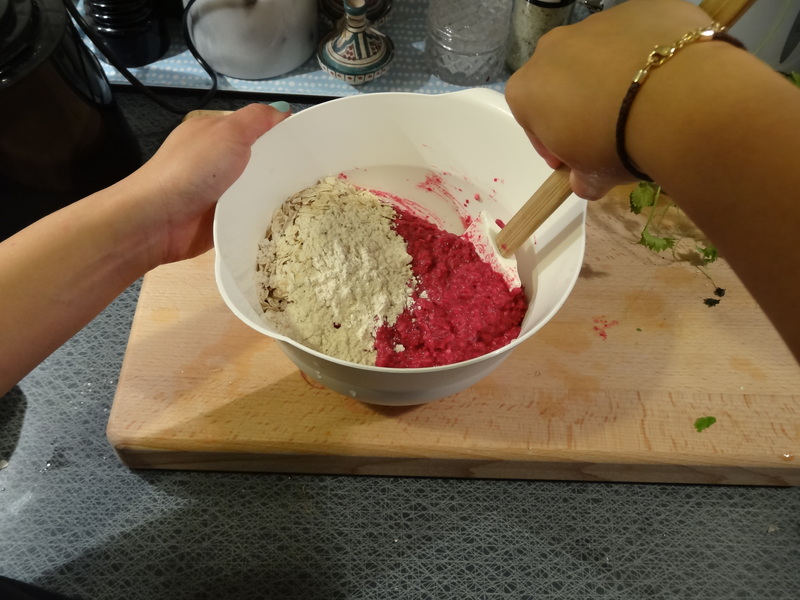 This entry was posted in Dinner and tagged beetroot, dinner, homemade, parmesan, pasta, spinach, vegetarian, walnuts on 2015-01-22 by activebeans. 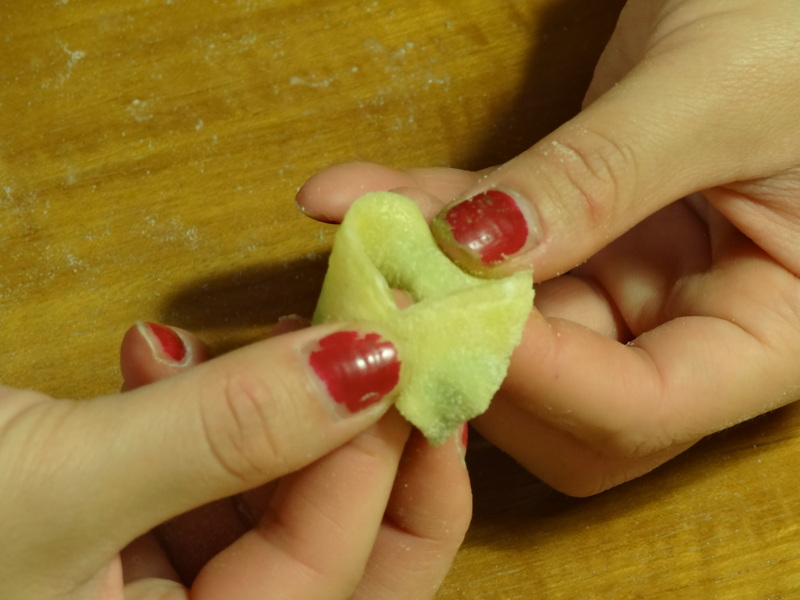 We used 2 different ways of folding the tortellini in this recipe and the inspiration for the second example is taken from the cookbook “Simply Italian, Cooking at Home with the Chiappa Sisters”. 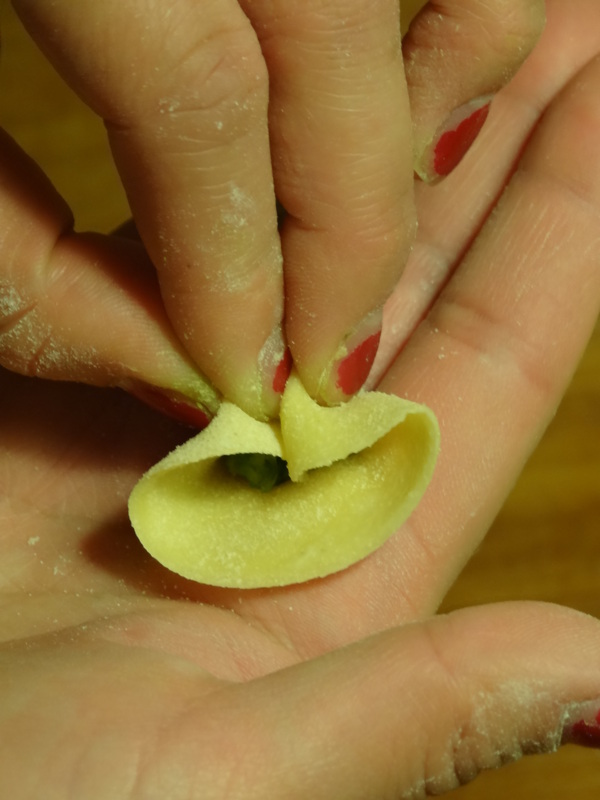 To make the pasta, see the steps here. 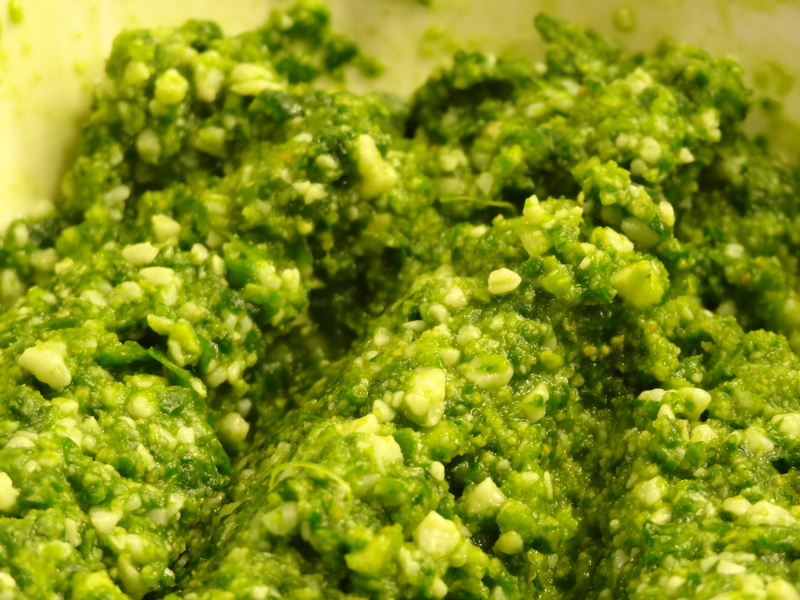 Put 2 cloves of garlic, the spinach, 1 egg and the parmesan in a food processor and blend until it is finely chopped. Add the bread crumbs to the mixture and mix well. Chop the courgette in small cubes. Chop 2 cloves of garlic. Fry the courgette and garlic in some butter in a frying pan for 5-10 mins. Cut the vine tomatoes in smaller pieces. Add them to the courgette in the frying pan and fry for another minute. 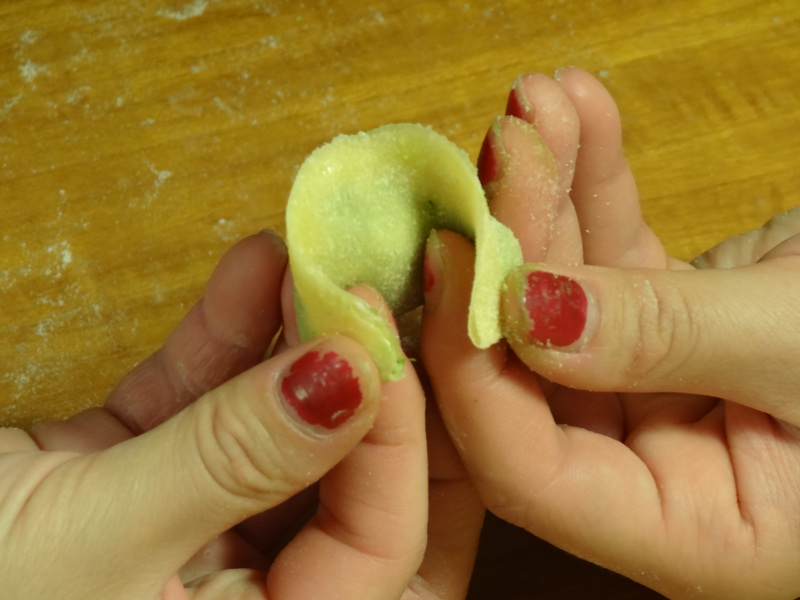 Remove the frying pan from the heat while you do the tortellini. Roll out your pasta sheets using a pasta machine or by hand. Don’t cut too many circles at once because they will dry out quickly. 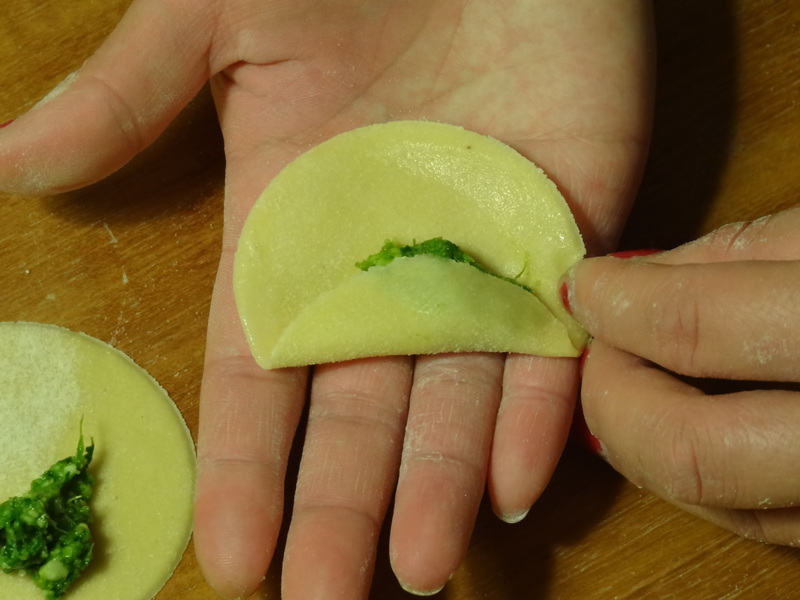 Fold the circle in half to make a half-moon shape. 2. 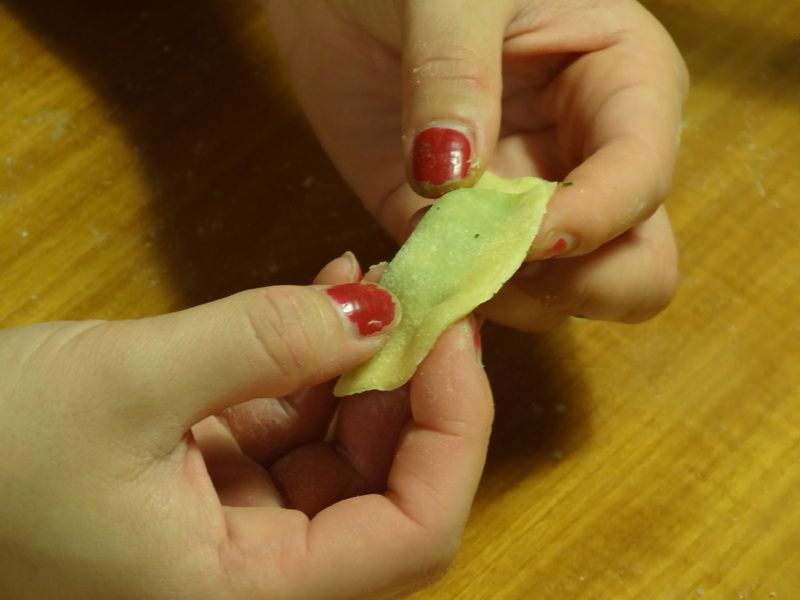 Squeeze the edges together tightly and flatten the half-moon shape. 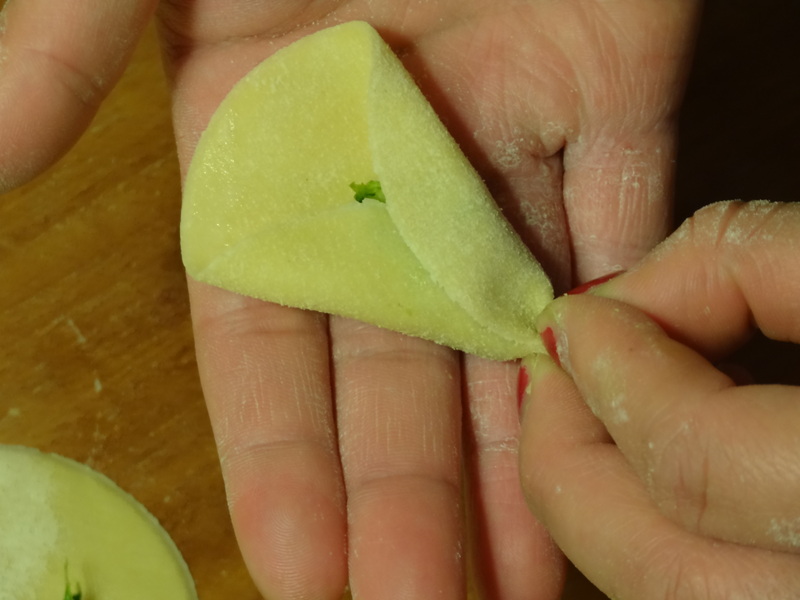 If the dough is too dry to seal, put some water around the edge of the circle. 4. 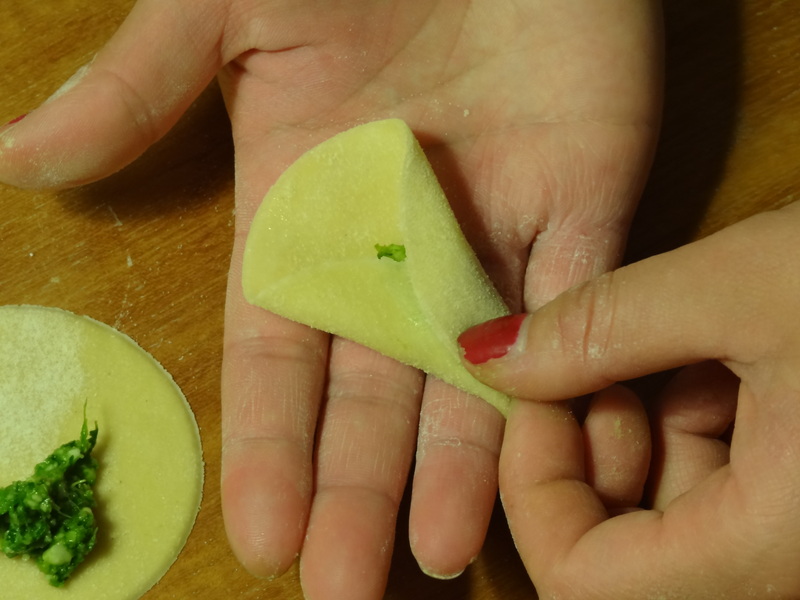 Fold down the top part of the tortellini to give it a nice shape. Fold one side of the circle to the middle. 2. Do the same thing with the other side. This side should slightly overlap the first side. 3. Begin to pinch the circle together, starting at the end of the folded part of the circle. 4. Continue pinching the circle together all the way to the top. 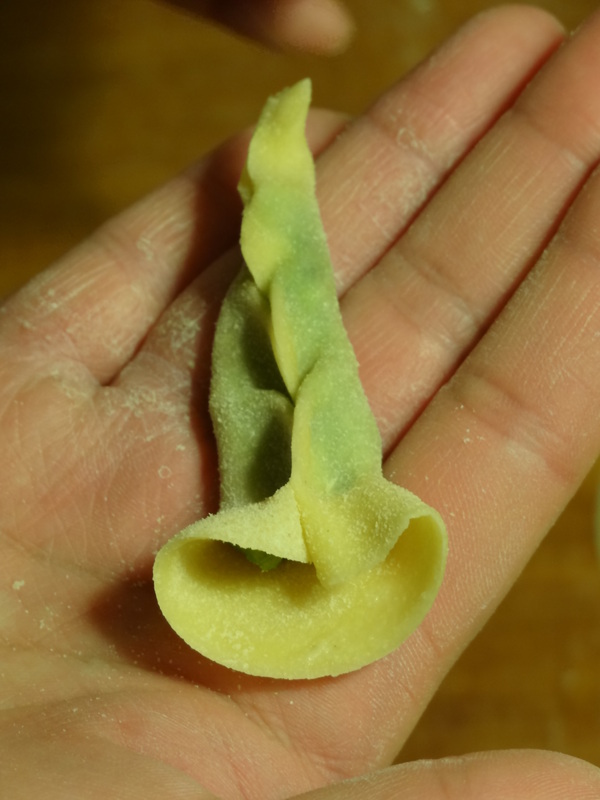 Let your tortellini dry for 10 mins on a drying rack, that makes the tortellini hold its shape when you boil it. Boil the tortellini for 3-4 mins in salted water in a large saucepan. Turn on the heat again for your courgette and tomatoes. Add some salt, pepper and truffle oil. Add the cream and let it simmer on a low heat until your tortellini is ready. 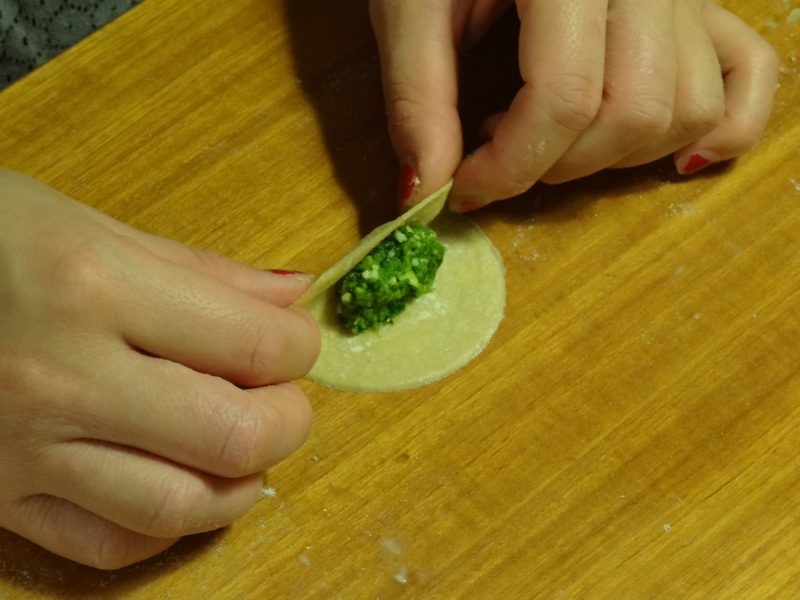 Place some tortellini on a plate and add the sauce. 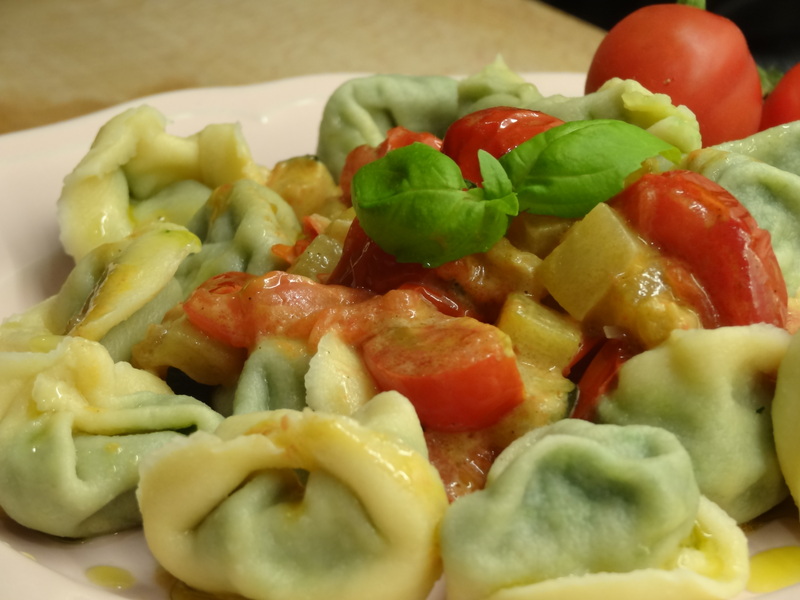 This entry was posted in Dinner and tagged dinner, homemade, pasta, spinach, tomato, tortellini, vegetarian on 2015-01-03 by activebeans. 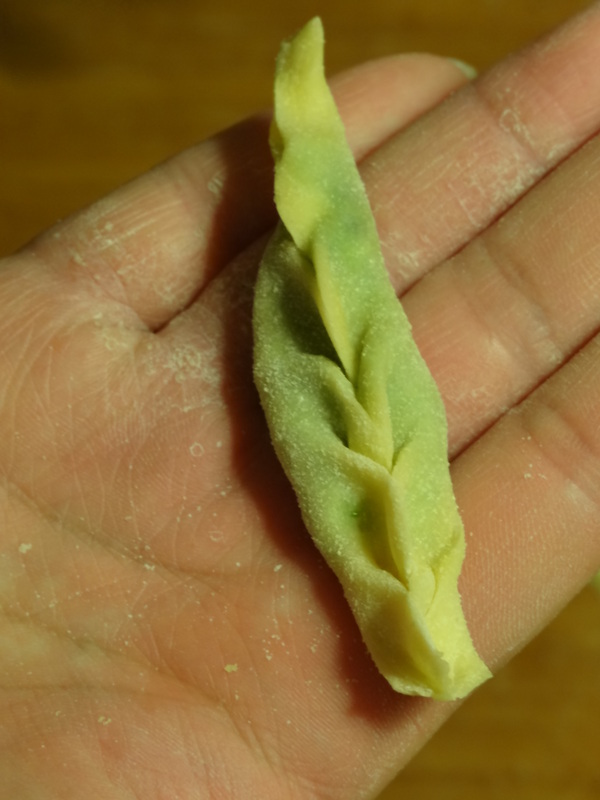 This entry was posted in Dinner and tagged dinner, homemade, pasta, spinach, vegetarian on 2014-12-28 by activebeans. This entry was posted in Dinner and tagged dinner, glutenfree, homemade, spinach, vegetarian on 2014-12-21 by activebeans. 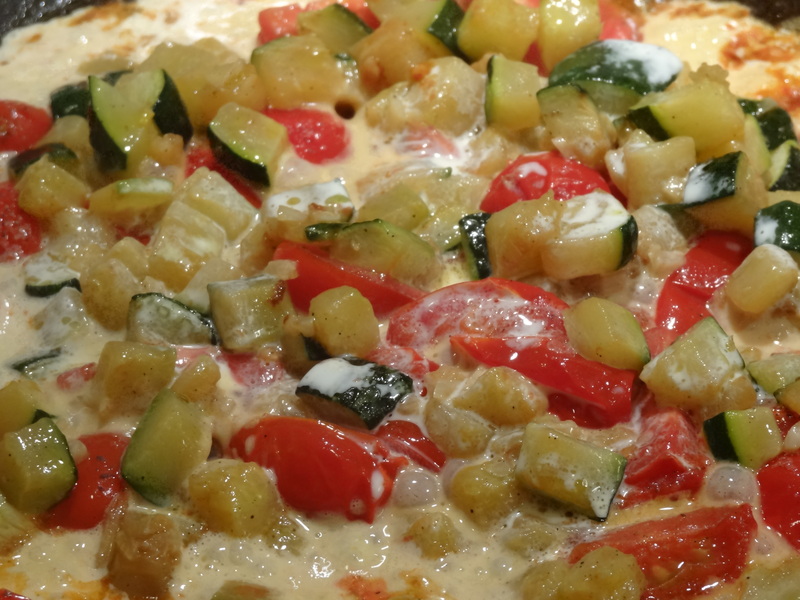 This entry was posted in Dinner and tagged cheese, dinner, homemade, pasta, spinach, tomato, vegetarian on 2014-11-18 by activebeans. In the past we have tried to make different types of vegetarian burgers. In this recipe we have used few ingredients, but they all give lots of flavour and good texture to the burger. They are very quick to make since we use a food processor to mix the ingredients and then the burgers only need to fry for a few minutes on each side. What adds to your cooking time is if you make your own buns. We have put up a recipe on the blog that we use when we make buns. We normally make all our bread ourselves since we want to know what is in the bread. When you make your own bread you use very few ingredients and you know there is no added sugar or other strange ingredients. 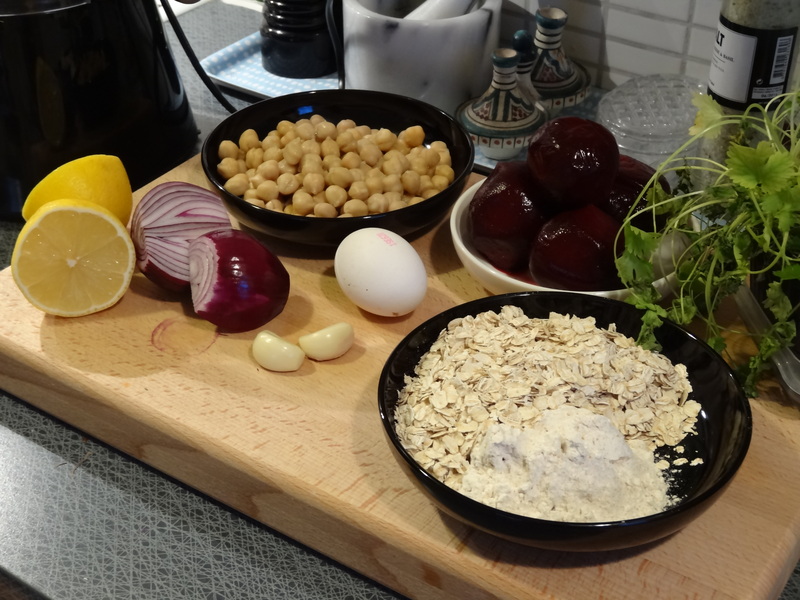 Mix the beetroots, chickpeas, 1 onion, garlic, half the flour, half the oats, 1 egg and coriander leaves together in a food processor. (If you don’t use a food processor you need to chop the ingredients finely). Put the mix in a bowl and stir in the rest of the flour and oats. Mix in the lemon juice and the salt and pepper. Shape the pieces into balls and put them in a frying pan. Flatten the balls with a spatula. Fry them for a few minutes on each side. After they are done, put them on a plate. 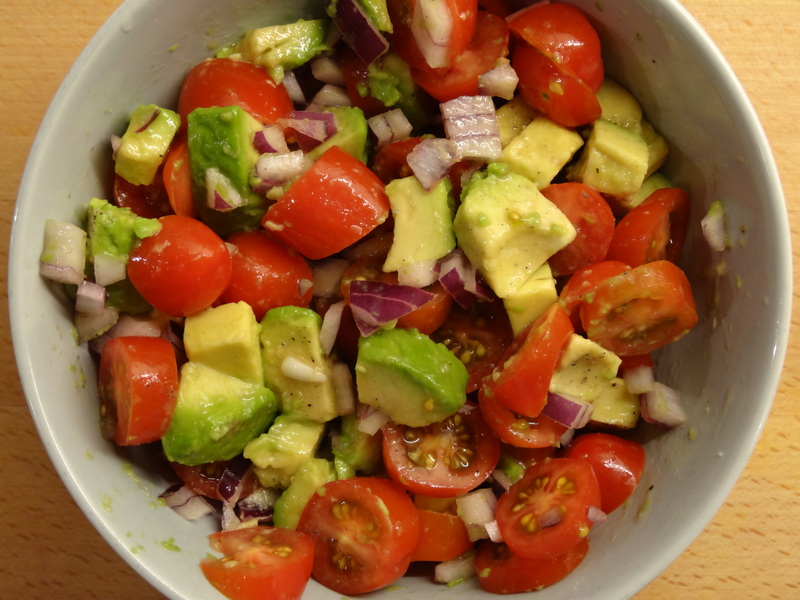 Chop the rest of the onion, avocado and cherry tomatoes. Put them in a bowl and add some lemon juice, salt and pepper to make a nice salsa. Take a bun and cut it in half. Spread some mayonnaise on the inside of each piece of bread. 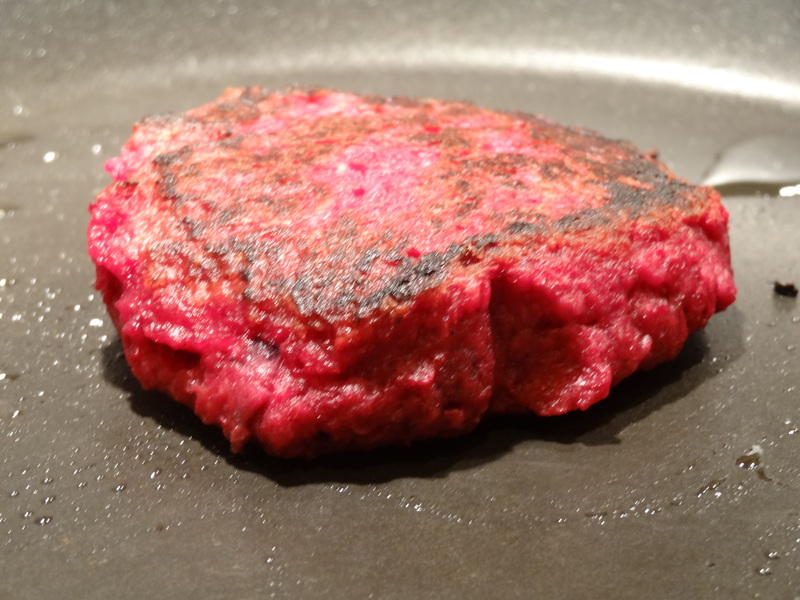 Put the beetroot burger on the bottom piece. Put some spinach leaves on top of the burger and the top piece of the bun. Serve the burger with the salsa. 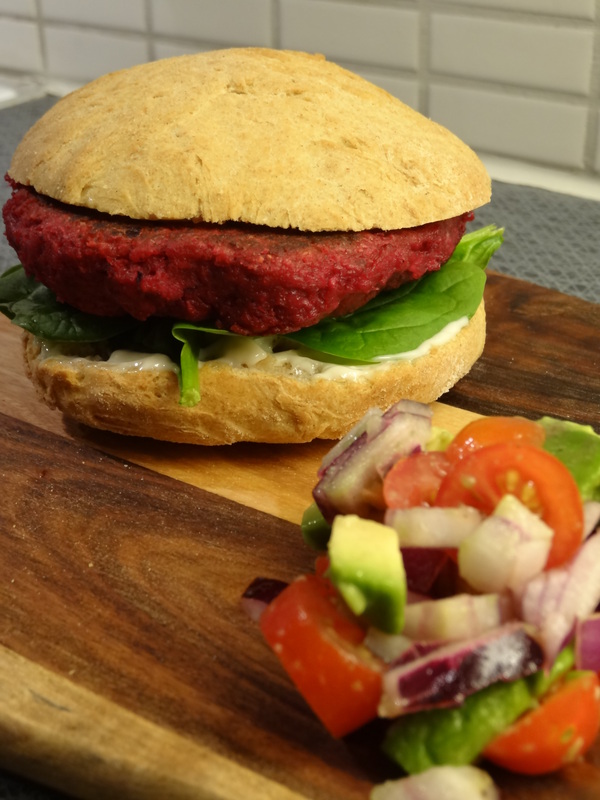 This entry was posted in Dinner and tagged beetroot, bread, hamburger, homemade, spinach, vegetarian on 2014-10-15 by activebeans.